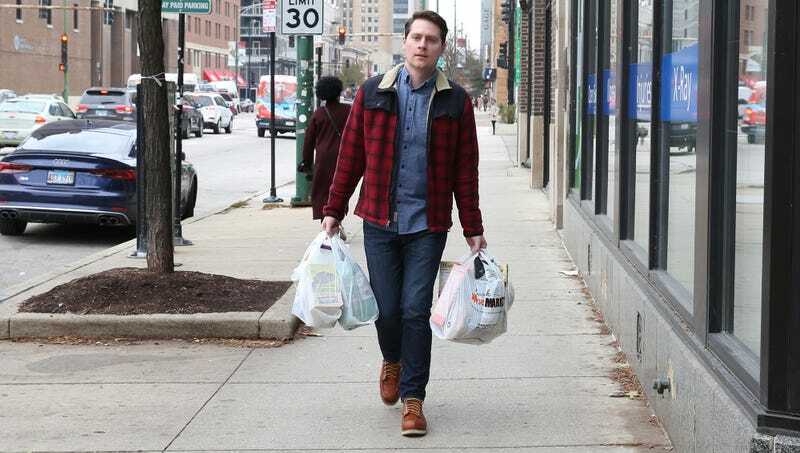 MARIETTA, GA—Infusing his muscles with sudden and desperately needed power, the adrenaline supply of local man Simon McManus intended for lifting a car off a loved one was called upon Tuesday to carry four grocery bags at once. According to sources, McManus’s adrenal gland flooded his system with the stress-triggered hormone as he hoisted the four bags from his trunk, providing him with the same elevated strength that he might otherwise use to free a small child that had been pinned under the very same vehicle. Reports confirmed that, without the adrenaline surging through his veins in the same way it would have if he needed to clear away a thousand pounds of twisted metal that was crushing a family member, McManus would never have been able to carry the heavy sacks containing milk, fruit, and laundry detergent up two flights of stairs and into the kitchen. At press time, the effects of the adrenaline had worn off, and a depleted McManus reportedly lay on the couch clutching a pack of Oreos as he might collapse near the mangled ruins of his car and cradle his rescued daughter.